It’s that time of year — the time to reevaluate your PPC campaigns in order to improve and strengthen your strategies. In the last quarter of 2015 alone, Yahoo, Bing, Google, Facebook, and Twitter debuted new extensions, features, and targeting abilities that are going to spruce up your campaigns well past the New Year. Resolve to read up on the latest advancements to outperform your competitors in 2016. Digital advertising offers some creative ways to reach consumers on all types of devices. But even when an ad brings a visitor to your site, it’s not a guarantee the visitor will convert. According to Bing, “96 percent of first time visitors leave websites without converting.” Fortunately, there are second chances. In October, Bing released remarketing in Bing Ads, a new targeting upgrade for Search and Shopping campaigns that displays ads to people who have clicked on a Yahoo or Bing ad, and then have left your site without converting. Remarketing allows you to display better-tailored ads to people who have already been introduced to your products and services. Change your ad group bids for people in your remarketing lists. The adjustments will go into effect when those users search for the items you’re bidding on (Shopping campaigns) or search using the keywords you’re bidding on (Search campaigns). A higher bid bumps up the rank for ads shown to these users. Configure ad groups to only be triggered and show ads if a user is on your remarketing list. So, for example, your remarketing ad groups can include broader and more-generic keywords than in your “regular” search ad groups. Another way to dress up your Bing Ads and increase the ROI of your campaigns is to use Image Extensions to add pictures to your ads. Earlier this month, Bing Ads introduced the ability for advertisers to add up to six images to ad copy and other ad extensions on PCs and tablets, but not on smartphones. You can further customize the ad experience by including a unique URL for each image, which means you can choose where your customer goes after clicking on your ad. At this time, Bing Ads is trying out different layouts and variations of content and images. Bing Ads Image Extensions can be used in all markets. If you can’t find the Research Keywords tool in Bing Ads, it’s because it’s now called the Keyword Planner. In September, Bing Ads released the new Keyword Planner, a tool that provides advertisers with relevant keyword and ad group suggestions. Users can also find new keywords by multiplying keyword lists. But what takes the tool to a new level and makes it a formidable competitor to the AdWords Keyword Planner is the tool’s addition of search volume data and trends, plus performance and cost estimates. Performance and cost estimation data is available at the ad group or keyword level. Already have a list of keywords? The Keyword Planner allows you to upload your list as a CSV file or paste it manually so you can group the expanded keyword set into ad groups, or discover the popularity of those keywords. Bing and Google are no longer the only search engines that offer product ads. 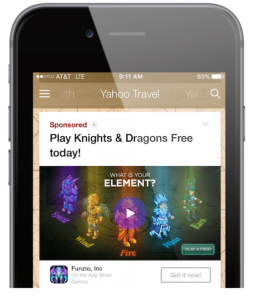 In November, Yahoo announced Product Ads for retailers that can be displayed on desktop, mobile, and tablet devices. 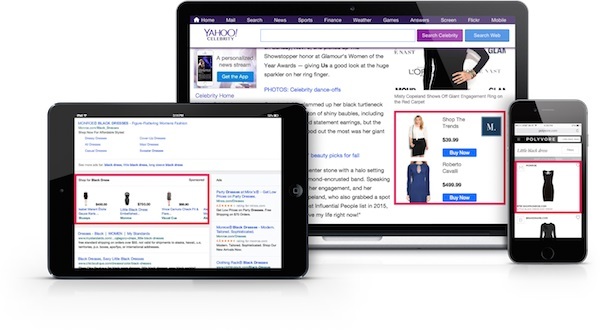 These ads can show up in Yahoo Search and Polyvore, the shopping website Yahoo purchased earlier this year. According to the announcement, Kohl’s Wayfair and Overstock.com have already started using services related to Yahoo Product Ads. The data used to create the ads comes from customer product feeds, so you can now create digital product ads for all three major search engines. Gemini’s updated custom audience feature is for mobile app marketers and can target audiences on PC, mobile, and tablet devices. Google’s latest feature helps advertisers reach their most valuable clients, the ones who have already purchased a product or joined a loyalty program. Marketers can now upload an email address list, which is then matched with signed-in users on Google. Once matched, advertisers can build campaigns and ads for that specific audience. Google also creates a second list, a “similar audience” list, which is made up of people who share interests and behaviors with the people on your email list. Advertising to the second list, while excluding the first, can be a sound strategy. Why pay for a digital ad that hasn’t been seen? Google announced in November that all CPM campaigns (ones that are charged on a cost-per-thousand-impressions basis) are now viewable CPM campaigns. This means that marketers will not have to pay for an impression on the Google Display Network unless it’s viewable by a user. 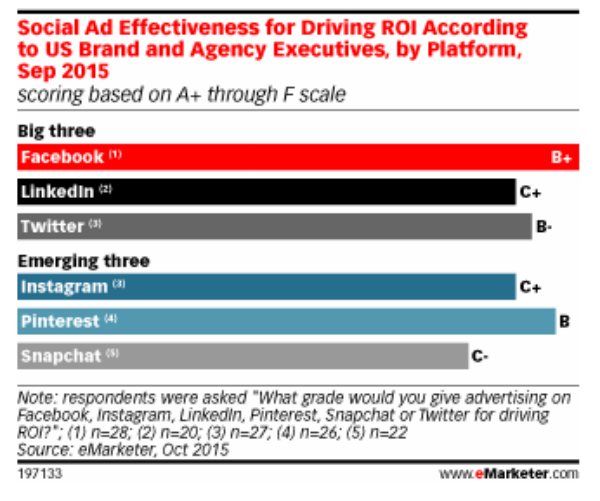 When asked to grade a social network’s ROI on a scale of A+ through F, Facebook and Pinterest received an average grade of B and B+ respectively. LinkedIn got an average grade of C+, Twitter received a B+, and Instagram earned a C+. Whether you’re new to paid advertising on social media sites or you’re a seasoned marketer, take advantage of these fancy enhancements to digital ads on Facebook, Instagram, and Twitter. If you want your ads to feature video content but don’t have a lot of time or resources, Facebook has made it easy for you. Facebook announced in October the addition of Slideshow, a way for advertisers to build “video” ads from still images. You can upload three to seven still images at a time, either from a video that’s already made, a photo shoot, or stock photos from Facebook’s library. Marketers can edit the length of the slideshow from 5 to 15 seconds. Slideshow is available in Power Editor and Ads Manager. The best analytics tools give us the information we need to tweak and improve our campaigns. The latest product in Twitter’s analytics toolbox is Brand Hub, a tool released in October that shows marketers a ton of information about their Twitter advertising campaigns. 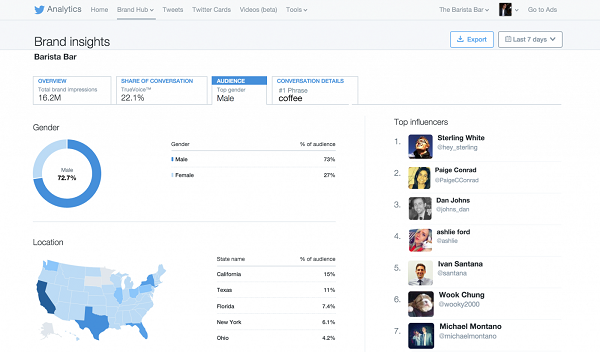 According to the announcement, Brand Hub sheds light on the way customers talk about a brand on Twitter. This includes how many Tweets are posted about the brand or product and more. It also helps keep track of when users talk about a brand, and reveals detailed information about the audience, including their gender, location, occupation types and other demographic data. It’s time to tell a story with Twitter ads. In October, Twitter started testing Promoted Moments, a new ad format that turns Twitter Moments into ads. Moments was introduced a few weeks before Promoted Moments, and is Twitter’s way of bringing the best of Twitter to one place. By tapping a lightning bolt tab of the same name, you get to see a page full of created Moments. Twitter Moments tell a story and feature autoplaying images, videos, Vines and GIFS. With Promoted Moments, an advertiser can use a storytelling format to create an ad. It’s a unique way to engage your target audience and promote your brand. A new year is an opportunity let go of the marketing strategies that don’t work and improve on the ones that do. Make sure your PPC strategies deliver increasing ROI by updating your campaigns with the latest paid search, display and social advertising features above. Need help? Bruce Clay, Inc. offers world-class PPC management services for businesses that want day-to-day, hands-on support for their PPC advertising efforts. While we’ve been doing this for about 20 years, our company recently added top-ranked paid search expert David Szetela to the team to give you the ultimate edge of search advertising strategy. 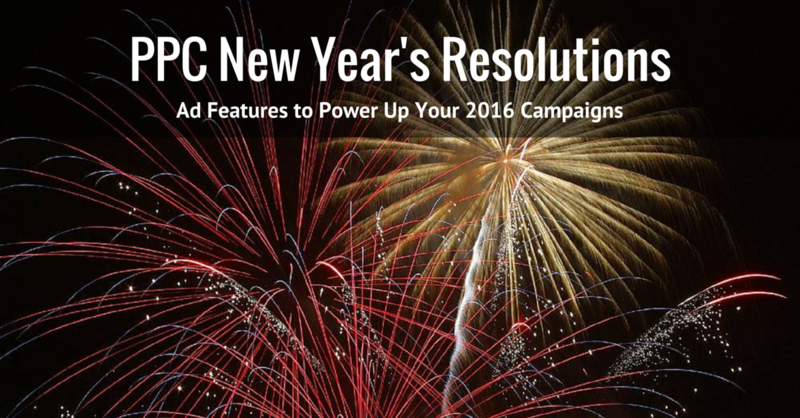 One of your smartest New Year’s resolutions might be to talk to BCI! Thanks for the updates. Lots of stuff happening on paid advertising this year especially on social media ads. I think it would be helpful for us. Thanks for sharing this article with us.